This recipe shows how to create entities in a SpatialOS game using the SpatialOS Unity SDK. A new enemy needs to be spawned for players to fight. Items dropped on the ground are represented by entities. A new client connects to the game and a character entity needs to be spawned for the player to control. In this recipe you will be creating simple cube entities on your server-side UnityWorkers, based on player-input to the UnityClient worker. Each time a player presses their mouse button, a new cube entity will appear for all connected clients. You can use the Unity Starter Project as the starting point of this recipe, or use the ideas and code snippets in a project of your own. The most important decision is which worker should perform the spawning of the cubes. Creating entities requires appropriate worker permissions (usually defined in default_launch.json), which UnityWorkers are granted by default. To achieve your goal you could grant UnityClients permission to create entities, but if clients are malicious they could use this to create entities in an uncontrollable way. It’s therefore generally preferable to send your player’s requests for entity creation to the server-side workers which can fulfill the request if they consider it appropriate. Add a Spawn component event to a new CubeSpawner component which will handle the Player’s new ability. Add a client-side script to trigger the Spawn event based on player input. Add a server-side callback for when the Spawn event occurs. The light-blue boxes are the scripts which you will create. The rest is already handled by SpatialOS. Create a new file called CubeSpawner.schema in the schema/improbable/player directory. In this component you will define a single component event, spawn. 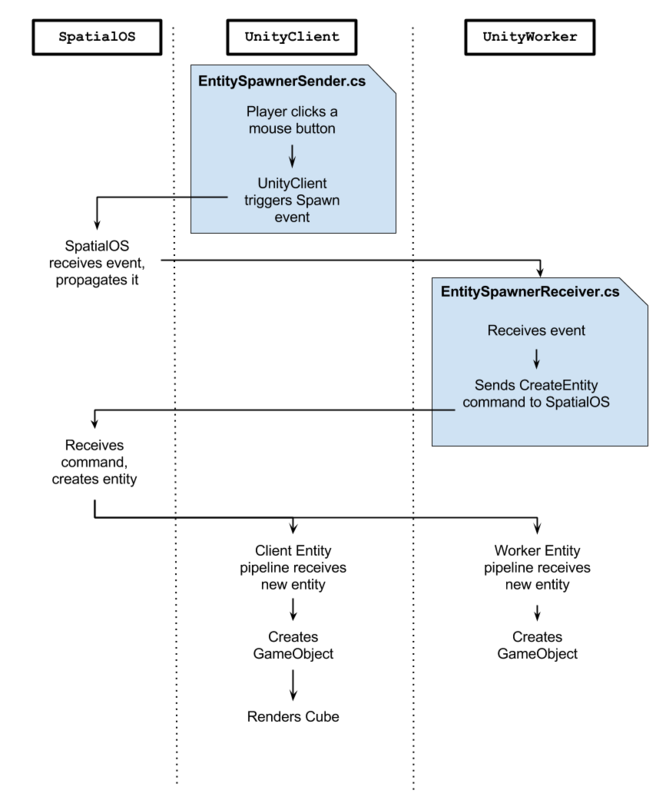 Component events define a package or payload of data to be synchronised with the event. You will define this payload as a new type, SpawnData, which will contain a single coordinate position - the location at which the cube should be spawned. After creating CubeSpawner.schema, don’t forget to generate the code either through Unity SpatialOS window > Build > Generate from schema > Build or by running spatial worker codegen. In the C# files of your Unity project, navigate to where your Player entity’s components are defined. In the Starter Project, this is in Assets/Gamelogic/EntityTemplates/EntityTemplateFactory.cs, in a function called CreatePlayerTemplate, and uses the EntityBuilder syntax to include components in the entity template and set their write-access permissions. Normally write-access for a component is configured for a type of worker, but in this case it is tied to a WorkerId (using the convenient SpecificClientOnly function). This guarantees that only one specific client can ever have write-access to the entity’s CubeSpawner component: the client belonging to the player which ‘owns’ that Player entity. Next you will add a client-side script to the Player which will respond to mouse clicks by triggering the Player entity’s spawn event. The [Require] syntax specifies a CubeSpawner.Writer, so this script will only be enabled on the one worker which has write-access to the entity’s CubeSpawner component. On each Update() call, a mouse button-up prompts the UnityClient worker to send a Spawn event (by adding it to a component update). SpatialOS will then synchronize this event across all interested workers (which have the Player entity checked out into their view) will be notified by SpatialOS of the Player entity’s event. The “interested workers” in this case may be other UnityClient workers (other players) as well as UnityWorker workers. In the next section you will attach a server-side callback to that event so that and event triggered by the UnityClient worker is responded to by the UnityWorker. In our scenario, the Player entity is both the cause of the creation and the creator of the Cube. The cause is a client-side event and the creation is a server-side event, but in both cases the logic being executed is associated with (or on behalf of) the Player entity. SpatialOS events are very effective for this type of communication between representations of the same entity but on different workers. In other scenarios, where communication between entities is desired, using a command instead of an event might be a better decision. For a more thorough discussion, see Component best practices. You’ll now add a server-side script to the Player which will attach a callback to updates of the CubeSpawner component, which will use the entity creation API to create a new cube entity in response. SpatialOS component events (such as the spawn event you created) can be received by multiple workers, so the [Require] syntax is used to require a Position.Writer, which only one UnityWorker will ever have. This lets us guarantee that only one Unity worker will execute this code and attempt to create a cube entity in response to the event. The SpawnTriggered Unity event which is accessible through the Reader was automatically created from the spawn component event during codegen, and this script adds a callback function so that this worker executes some logic in response to the event. The SpatialOS API includes worker commands, which can be performed by a worker independently from any entities or components. In this situation we are using the CreateEntity worker command. If the worker is not configured to have entity creation permissions then this command will fail. The above script is running on a UnityWorker which by default does have entity creation permissions, so as a result SpatialOS will create a new Cube entity. The CreateEntity function accepts an Entity object as a template for the new entity it will create. The entity template describes the components an entity will have, defines some initial values and sets its worker write-access permissions. The new entity’s initial position is determined by the value in the Position component of its entity template. In this example the position is set using a value carried inside the spawn event’s SpawnData payload. With this in place you are ready to run the game and spawn some cubes. Head back to Unity and rebuild all entity prefabs, build workers and regenerate the seed snapshot. Have a look at What and when to build if you are new to the development workflow. Press Run in the SpatialOS window under Run SpatialOS locally to start the game. After it loads, start the UnityClient scene in your Unity editor to connect as normally. Once connected, clicking the left mouse button should spawn a cube on top of the one which is there on start-up. You should also be able to see the game object for the newly created cube entity appear in the Hierarchy window in Unity as well as in the Inspector at http://localhost:21000/inspector. This step is intended to make the creation of the cubes a more visually obvious. It is not required as part of the actual entity creation process. If you spawn multiple cubes, you will notice they just appear in the same place. In order to make them physical, add a Rigidbody component to the Cube entity prefab found in the Assets/EntityPrefabs directory of your Unity project. After rebuilding the Cube entity prefab and restarting the game, your cubes should be affected by gravity as well as collisions. To take things further, you could create a PositionSender whose purpose is to update the Position component of Cube entities in response to changes in position on the client. Building on this leads to topics such as Client-Side Prediction and Server reconciliation and Access control lists. In this recipe you have looked at code required to create new entities at run-time, using the CreateEntity worker command and an entity template. Component events to send information from client-side to server-side. [Require] syntax with a component Writer to ensure only one server-side worker responds. The CreateEntity worker command to create a new entity using an entity template. If you are interested in other entity management functions you can find information on deleting entities in the Unity SDK documentation.